Modern city management always includes cooperation with the retailers of a city. 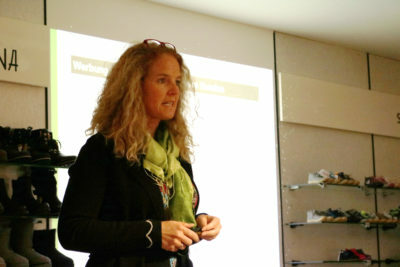 The charismatic city manager Nicole Halves-Volmer works with passion for the city of Delmenhorst and talks in the interview about campaigns with and for retailers. Ms. Halves-Volmer, why do you host events and meetings for your city’s retailers? We – the Delmenhorst Business Development Association (Delmenhorster Wirtschaftsförderungsgesellschaft, dwfg) – have created the “City Impulse” event series as a communication platform that brings city center stakeholders together. Retailers, in particular, are given the opportunity to network with other city interest groups and deepen the conversation about topics that benefit the city center. How many retailers does Delmenhorst have? There are about 420 businesses throughout the greater city area (as of 2016), of which 113 are located right in the city center. What joint measures and campaign activities do you embark on together? Based on our Delmenhorst city management concept, these are primarily measures geared toward improving the public amenities, measures for retail space management, as well as various campaigns and projects to improve customer loyalty and retention and of course the setup and maintenance of networks, which also includes the “City Impulse” event series. How do customers respond to these events? The people of Delmenhorst like to party. There are a number of time-honored events like the Potato Festival, the City Festival, the so-called Kramermarkt (fair), the Autofrühling (car show) in the spring or the Medieval Festival “Graf Gerds Stadtgetümmel”. These events are very popular and attract tens of thousands of visitors each year from Delmenhorst and the surrounding area. My job within the dwfg includes the integration of the retail sector. Do you see any differences between locals and visitors to the city? The different events attract different audiences. The Potato Festival is definitely a fixture in the region’s calendar of events. We have many visitors from the neighboring cities of Bremen and Oldenburg that come to this particular event. Having said that, the Medieval Festival “Graf Gerds Stadtgetümmel” is undoubtedly the event that draws in the most spectators. The dwfg has made a name for itself among the medieval events in Germany. Fans come to us from all over Northern Germany to celebrate on the Burginsel (Castle Island) in the middle of the Graft. The city presently has more vacant spots than usual, likely also due to the long restoration of its pedestrian zone. How do you try to counteract this development? After we set up an inventory of empty commercial real estate and contacted the proprietors, last year saw the launch of the first temporary use projects with the help of the dwfg. Following the opening of a creative shop and gallery in October, we plan to open HORST this year, a pop-up concept featuring a café, store and lots of space to experiment and try things out. We are also very curious to see how this innovative concept will be received. It goes without saying but that’s exactly why I chose this career. Things are never boring. You always need new ideas and lots of enthusiasm and persuasive power in this job. Delmenhorst is not the first city where you worked in city management. What do cities have in common when it comes to retail development? Right now, all cities are having a hard time due to the structural changes in the retail sector and thanks to fighting the price war with online competitors. The market is adjusting, the number of brick-and-mortar retailers is declining. The restaurant and services sector is only able to fill these market gaps in part. To succeed in the market, retailers must become even more flexible, be more receptive to the demands and wishes of their customers, frequently change their product selection and set themselves apart from other retailers that offer the same merchandise. Not an easy feat and certainly not feasible for many for a variety of different reasons. The dwfg city management can only offer its assistance in this setting and increase the amenities in the public space. In your opinion, what are the three biggest issues facing brick-and-mortar retailers at the moment? How do I maintain my market position? How can I restructure my business when things are already not going so well? It’s important to first ask yourself why your business is struggling and whether there is something you can do to change the course. Needless to say, there are also external influences like the already mentioned construction at the doorstep. However, usually this is only part of the problem and one often has limited power over it. You tell retailers: “We can plan events for the city, but you are in charge of attracting customers and increasing your store foot traffic.” What could Delmenhorst do to improve in this area? You actually already offered some great advice and ideas at the previous event. An interesting storefront window design, clever shop fittings, a targeted customer approach, excellent service and generating consumer demand by regularly changing the product selection. Retailers should also consider offering Wi-Fi services at their stores or provide consulting and services on their website or create an online store. Introducing a customer loyalty program can also be the right move for a business. There are many options available on the market. This is an area where each retailer must determine the best fit, how it can be financed and carried out. What are your future plans for the retailers in Delmenhorst? The retail community still needs to grow together more. Networking events like “City Impulse” are very helpful. Together we can make things happen in the retail world with many small, nifty campaigns. The people of Delmenhorst have to believe in themselves and their city center again. I also want to inject my expertise with dwfg and contribute to the further development and design of our city center.